The process for renewing contracts for the first independent treatment centres has been described as a “pig’s ear” by the chief executive of the largest independent provider in that sector. Ten of the “first wave” contracts are due to expire in the next six months – with the general election expected midway through that period – and the future of many of the centres is uncertain. At least one, the Kidderminster treatment centre in Worcestershire, is likely to close its doors. The centre will return to NHS use from next month, although the team running it plans to continue doing NHS work at a local independent hospital. The future of the Greater Manchester surgical centre hangs on whether owner Trafford Healthcare Trust decides to use the site itself or to rent it out. Many of the others are likely to continue but will offer treatment at tariff through patient choice, rather than through a block contract. 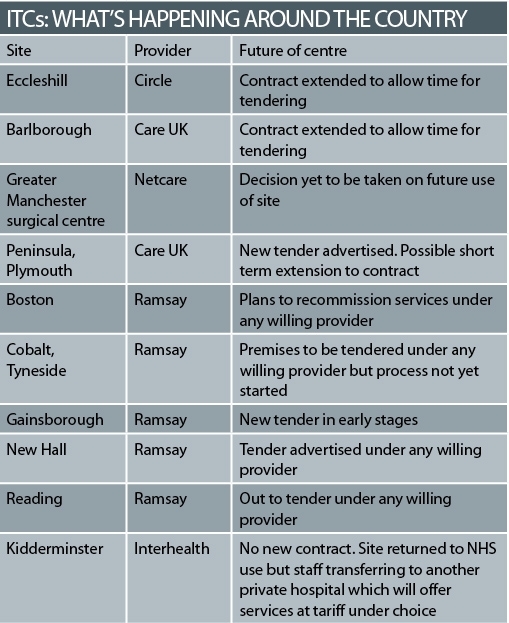 The firms running the centres have been told they have to go through a tender process to rent the buildings from the NHS – leading to uncertainty for staff and patients. Mike Parish, chief executive of Care UK, which operates two sites coming up for renewal, said this had led to a “pig’s ear of a process”, with firms being offered short term contract extensions at the last minute because primary care trusts still had the contracts out to tender. At the Barlborough centre in Chesterfield, run by Care UK, staff had to be formally told they were at risk of redundancy – only for managers to hear the next day that its contract had been extended. Several PCTs are at an early stage in inviting tenders for their sites. Lincolnshire PCT does not expect a new contract to come into force at its Gainsborough site until next year, according to tender documents. Many new leases will be for only three years, so PCTs and centre operators may have to repeat the process in 2013. Mr Parish said independent centre operators had expected to switch to payment at tariff for any patients they could attract at the end of the original five year contracts, which offered guaranteed payments regardless of the number of patients treated. But they learnt a few months ago that if their premises were owned by the NHS, as most are, they would have to go through a tendering process in order to continue to use them. Operators will pay market rent for the sites in future. Care UK hit the headlines last week after reports its chairman had made a £21,000 donation to shadow health secretary Andrew Lansley’s office. to “accept private donations from companies that have a vested interest in their policy areas”. A Conservative spokesman said the donation was “fully within the rules”. Independent provider Ramsay said it “understands the need” for a tendering process but some contracts may have extensions to allow this to be concluded. The Department of Health said it announced in July that there would be a competitive tendering process where the NHS had identified a continuing need for services. It added there has been “an ongoing dialogue” between providers, the local NHS and the DH in each area. Care UK and Ramsay may apply to run centres they do not operate at present, and Netcare – which runs the Greater Manchester centre – says it will consider case-by-case bidding. NHS Partners Network director David Worskett was critical of the delay in resolving the contracts. In some cases, operators will be paid at tariff but are being given “activity plans” by PCTs – an indication of the level of work they will be doing, which should help manage cash flow. In others, PCTs say they now have sufficient capacity in the local healthcare system but they are willing to lease premises if the independent contractors take the risk of attracting sufficient patients. The centres will also no longer be bound by “additionality” rules, which prevented NHS clinicians working in them and often forced them to recruit clinical staff from abroad. The Liberal Democrats have joined the Tories in condemning health secretary Andy Burnham’s pledge to treat the NHS as the ‘preferred provider’. Speaking at private firm Circle Health’s conference in Bath last week, Liberal Democrat health spokesman Norman Lamb said the move to give NHS providers at least two chances to improve before allowing alternative providers to run services would severely hamper attempts to ramp up productivity in the NHS. Mr Lamb said providers should be judged on quality, not on their status, and accused Labour of being in the pockets of the unions. The move aligns the Lib Dems with the Conservatives, who have vowed to open up the market to more providers if elected, and, as Pulse revealed last week, have already begun talks with a host of private firms. Shadow health secretary Andrew Lansley, also speaking at the event, accused Labour of back-peddling on its reform agenda, but said his party would push ahead with stimulating competition. The views of both opposition parties were backed by Ali Parsa, chief executive of Circle, who urged the next Government to lower the drawbridge to all potential market entrants, and not waste time protecting existing providers.